Earth Net is an iPad Twitter Client which focuses on the location data stored in profiles and messages. 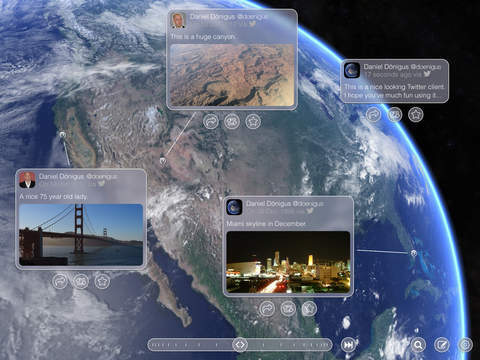 Using this app with its view on the earth makes browsing your Twitter network really fun. Whenever a message contains location information or the user has legible location information added to his profile, the position of the message/user is marked in the Earth View. The realistic rendering of the earth that respects day and night cycles, the time of the year as well as correct positions of the stars. 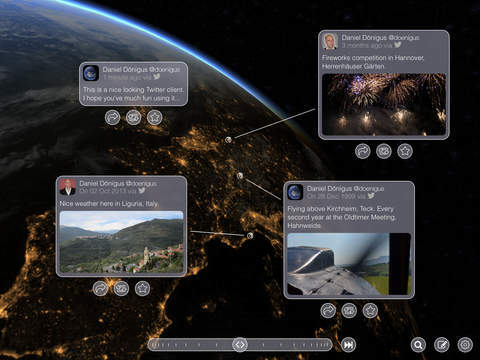 •	Viewing Tweets of users you are following visualized on top of the earth. •	Reply to, retweet or favorite messages of users. •	Searching for Tweets containing a certain keyword, visualized in the Earth View. •	Sending messages with a generated image of your locations. •	Day and night cycles as well as realistic positions of stars. Note: Imagery of the clouds is a still image and does not represent the current weather conditions.